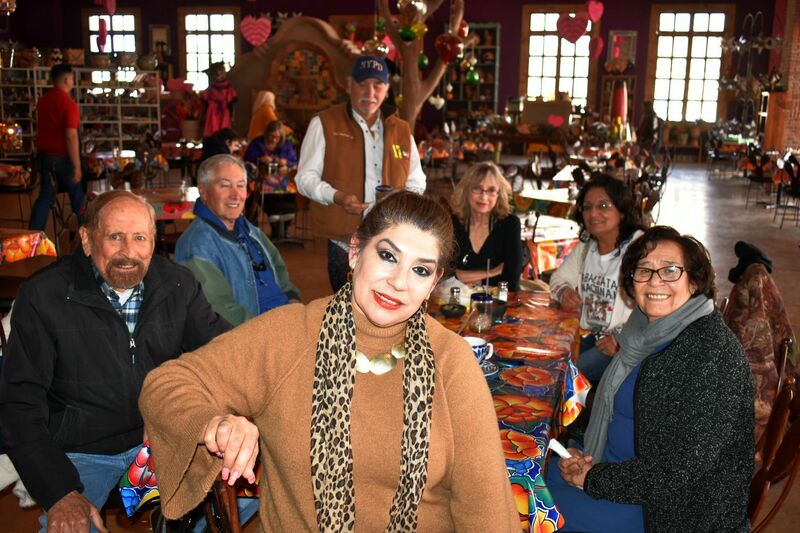 L to R: Background are Bill Armendariz – Editor in Chief of the Deming Headlight newspaper, Maria Jimenez of Casas Grandes, Mexico, and Alma Villezcas, FASF Treasurer; in forground are (L to R) July McClure, FASF Aerodrome Editor and John Read retired Mgr. of Pancho Villa State Park. Before his retirement last month, John made all the arrangements for the upcoming RAID DAY events at the local New Mexico State Park. 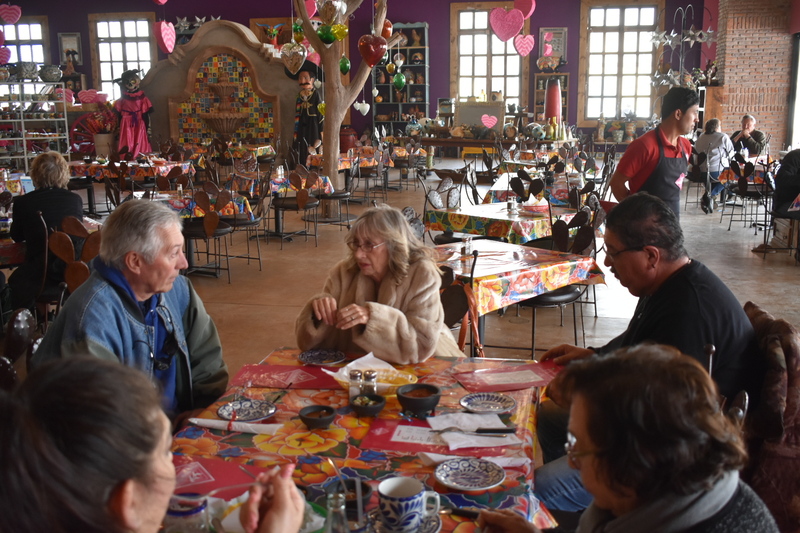 This past Friday, key members of the 2019 Raid Day Planning Committee met at the famous Palomas, Mexico “PINK STORE” (longtime commercial suporter of the FASF!) to discuss the upcoming annual RAID DAY event in Columbus. The below photos capture most of the participants. The majority of the group are all long time active members of the FASF. This year the memorial event, which commemorates the disasterous raid on the town of Columbus, NM, by Mexican Revolutionary General Francisco “Pancho” Villa, a tragedy which took the lives of some 18 innocent Americans, will fall on a Saturday, March 9th. Some 1500 of the Villistas (as Villa’s troops became known) attacked the sleeping village under cover of darkness that fateful day. In response to this attack, then US President Wilson ordered US Army General “Black Jack” Pershing to organize the “Punitive Expedition” as a means of capturing or destroying Villa in retaliation for the attack. It was this Expeditionary force that gave rise to the first US Military deployment in sustained combat circumstances of two new weapons: The Airplane and the Motorized ground vehicle. Thus, the incident saw the launching of the World’s Greatest Air Power in the small rural community of Columbus, NM. There will be many events taking place on RAID DAY, from public historical presentations at both Pancho Villa State Park and at the Columbus Library. FASF President, Ric Lambart, will conduct a slide and video presentation at the Library at 9:30 AM entitled “How Pancho Villa Saved the United States.” Three historian experts on the Raid will make their presentations starting at 1:00 PM at the Pancho Villa State Park Recreation Hall. The traditional RAID DAY Cabalgata Binacional, where horsemen (and women) from deep in Mexico ride into Columbus to join with hundreds of American riders, coming down from the North, will begin to enter the Village Plaza at approximately 11:00 AM. The Columbus Historical Society (CHS), under the leadership of local Historian, Richard Dean (whose grandfather was one of the civilians killed by the Villistas), will also hold its own traditional solemn Memorial Service at the Society’s Depot Museum at 10:00 AM. The joining of the Mexican and American riders is an annual gesture of the peace and goodwill now in effect between the two nations. All throughout the town, there will be vendors supplying Mexican and American food. 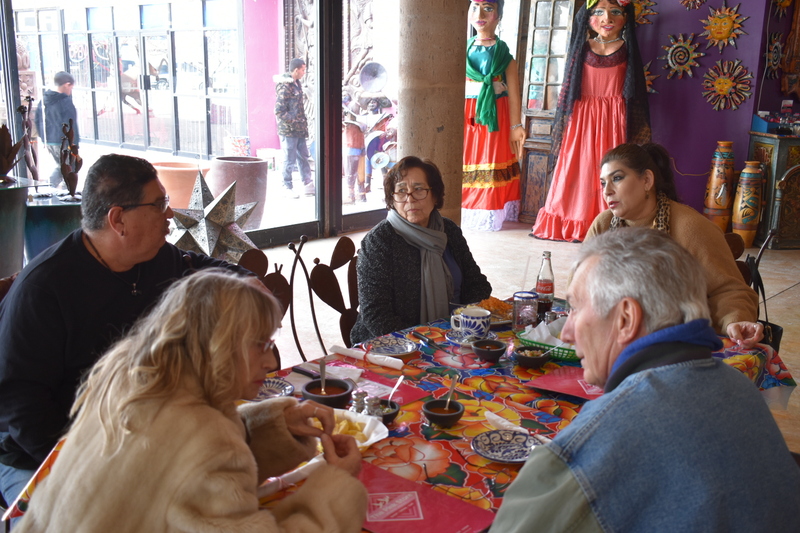 There will also be entertainment by local musicians, such as the FASF’s own July McClure, along with Mariachi bands, and traditional Mexican folkloric dancers. There will be much to see at this always well-attended event. In background (L to R),, John Read discussing plans with July McClure and Headlight Editor, Bill Armendariz. L to R above: John Read speaking with (standing) Raul Martinez, Cabalgata Parade Marshall and CEO of the Pancho Villa Development Corporation. The Pink Store waiter is speakiong to Norma Gomez, RAID DAY and CABALGATA EVENT organizer and Columbus Chamber of Commerce Secretary. July McClure is enjoying her lunch and Bill Armendariz gets some event information from Norma. The above photo of the planners was taken by Bill Armendariz. 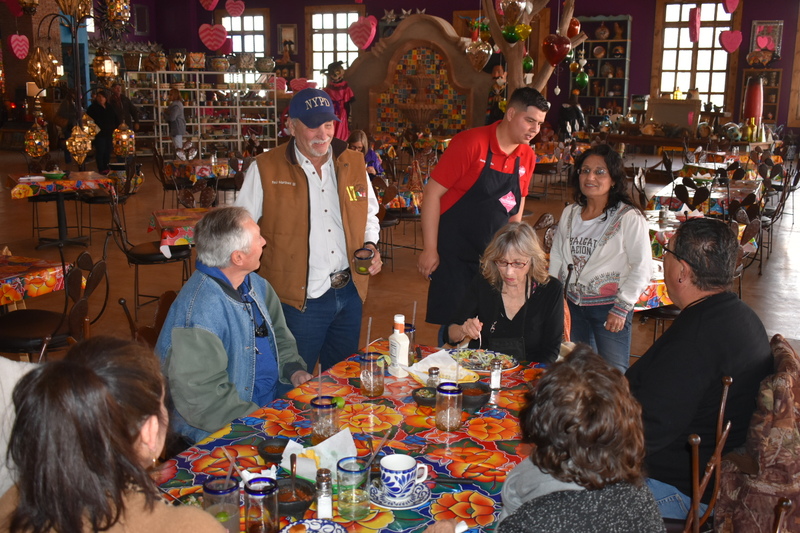 L to R: Ric Lambart, John Read, Raul Martinez, July McClure, Norma Gomez, Alma’s visiting guest from her homw down in Mexico, Sra. Maria Jimenez and Alma Villezcas in the foreground. This entry was posted in HOT NEWS! and tagged 1st sustained combat deployment of airplanes, 1st use of mechanized ground vehicles, Alma Villezcas, Bill Armendariz, Cabalgata Binacional, Columbus Historical Society, Columbus NM, Deming Headlight, John Read, July McClure, March 9 2019, Maria Jimenez, Mariachi Bands, Norma Gomez, Pancho Villa, Pancho Villa State Park (PVSP), Pink Store, Raid Day, Raul Martinez, Ric Lambart, Richard Dean, Villistas on February 25, 2019 by FASFRIC.